Railway horse drawn drays were used extensively in the early days of the railways, to bring goods to a railhead or take them away. Many thousands of these carts were built before the general advent of commercial motorised traffic. 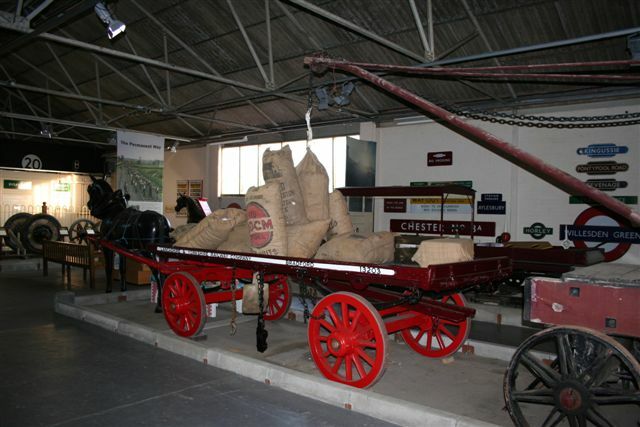 This one is believed to be only the second L&Y dray in existence, the other being in the York Railway Museum. No. 12303 has been extensively restored. Very little is known about this horse drawn road vehicle, which was found on a local farm. Originally drawn by a single horse, it is likely that the LMS sold it out of service, sometime after the 1923 grouping. The local farmer had used the vehicle as a trailer, removing the shafts and installing a drawbar to tow it behind a tractor. 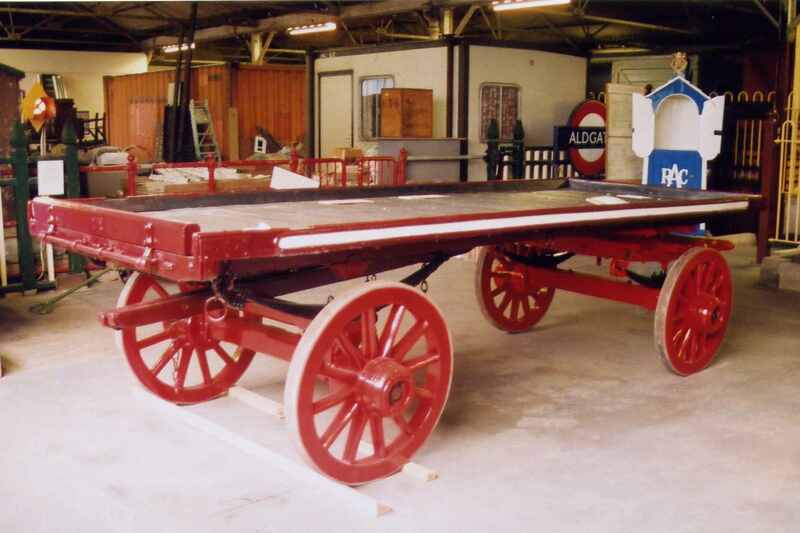 The wagon was taken off site during the early 1980s to the workshop belonging to one of Quainton's members, where new oak timbers were made using original pieces as patterns. New axles were made, and the axle stubs fitted, plus several pieces made for the fifth wheel, the turntable. All the metal fittings were cleaned and painted, including various chains, hooks and plates for the corners and ends of the wagon, side panel strips, half round strips for the top edges, various bars, bolts, hangers for the skids and even nose bags and buckets. The wheels were stripped of old paint, and treated for woodworm, primed and repainted, all the spokes were sound, but a new hub and several fellows (wheel trim) were needed. At this point fate intervened and for various reasons restoration stopped for a period, and some further deterioration occurred, meaning that a decision was made to replace the wheels with new, a wheelwright being located to make a new set. At the same time a mould was found to make a suitable horse for display at the head of the wagon. The type of horse used to draw these wagons was often a Percheron, a French breed, which was a lot bigger and stronger than the traditional British Shire horse.